I am happy to find myself writing today with my hat on for thought and action. After my morning read of some articles on nutrition, diet and health which I thoroughly enjoy; I have one that particularly met my eye and thought worth sharing. 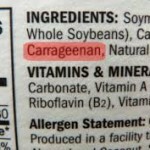 The topic is on a little known but commonly used food additive called carrageenan. Being able to pronounce the word alone is a feat, but what we have to discover about it as it relates to our diet and gut health may be worth your effort of further investigation. An article from the Environmental Nutrition April 2014 publication, page 2 “EN Explores Olive Health; Carrageenan Safety” (no link/subscription) introduces it to us and ask us to consider its use. The author Victoria Shanta Retelny, RDN, LDN writes that this additive is found in many of our common foods that are processed. Most particularly in foods that require a thickening agent. Examples are found easily in your dairy section. Such as yogurt, ice cream and cheeses. As you can see they do not reserve themselves to animal derivative and I have found that they are often more prevalent in non-dairy substitutions like soymilk and other non-dairy milks and tofu or vegetable-based cheeses and yogurts. Another place you can find carrageenan is in dietary supplements used as a emulsifier and bath products like toothpaste. The question of its safety writes Retelny is in regards to how it has been linked to gastrointestinal and other inflammatory conditions of the intestines. The research has been evaluated and used to suggest people with digestive disorders to stay clear of this additive. The evidence presented has thus far been based on studies done on cultured tissues and animals and this has not proven to have implications for humans. Retelny suggests however that we use our best practice of know-how when it comes to carrageenan and air on the side of caution until evidence can be brought forth for more evaluation. 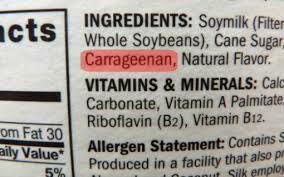 Additionally she concludes carrageenan doesn’t add any nutritional value to your diet; so its easy to eliminate. I tend to agree with the author’s analysis as it is currently in question of its safety use. While it may prove to not have any known implications, the link is enough for me to be aware and act accordingly. Besides there are plenty of alternative products on the market in the dairy and non-dairy food category that will allow us choice to avoid carrageenan without sacrificing our taste pleasures. Of course the best practice is to follow a diet rich in unprocessed healthy foods to really “thicken” your mealtime with rich health properties. Thank you Li, so happy that you found it informative. Thank you for supporting my passion.